At the Eastern Cape Highland Gathering, East London, 1956 the band fielded 7 pipers, five of whom were related. There was Pipe Major Knobby Clark, Pipe Cpl Ian Clark (Knobby’s 2nd son), Piper Lesley Clark (Knobby’s eldest son), Piper Sandy Clark (Knobby’s youngest son), and Pipe Sgt Ian MacPherson (married to Knobby’s only daughter, Jean). The saying goes, the band should have been called the ‘Clark Clan Pipe Band’. In 1955, a champion piper and piping judge, Maurice Forsyth, composed a 6/8 march “Pipe Major George Clark” in his honour. 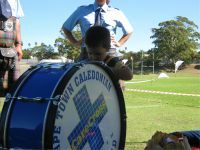 This was played for the first time to members of the band on the Sunday after the Eastern Cape Highland Gathering in 1956, where the band swept the boards with most trophies, except Champion piper, which Forsyth had won. The band adopted the tune and for the next decade or so, it was played as the ‘coming out tune’ after the MSR at every gathering the band entered. 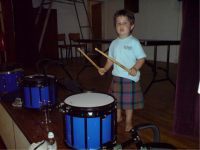 In 2009, the pipe band had five Marwick’s in the band – Philip on bass; Tyrone, his son, on pipes; Lesley and Andrea (Philip’s daughters) on tenor; Philip’s grandson of 4 years, Brogan, also on tenor.